Abbott’s next-gen FreeStyle Libre wins CE Mark, as announced by Abbott today, October 1, 2018. The glucose monitor, which eliminates the need for finger sticks, features optional alarms that users can customize, according to Abbott. 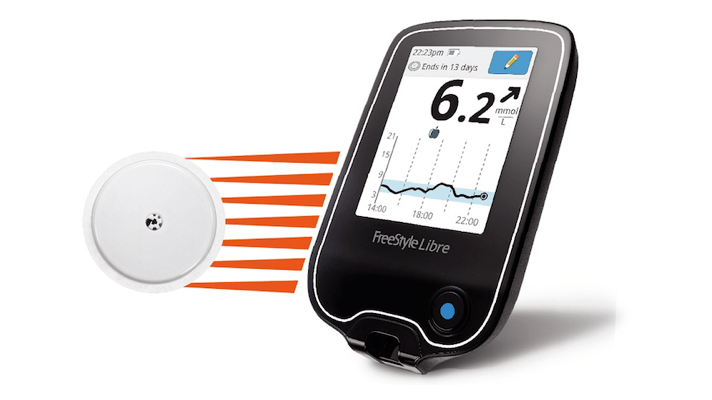 The FreeStyle Libre 2 system includes alarms to alert the user when it detects low and high glucose and an alarm to notify the user when the sensor can’t communicate with the reader. Users can decide if they want to receive alarms and if they want to be alerted via sound or vibration. Consistent with Abbott’s first-gen FreeStyle Libre monitor, users can also track glucose trends and patterns and view an eight-hour glucose history. 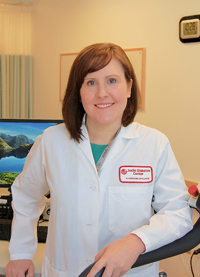 Muscle “switch” may control the benefits of exercise – A biological pathway that boosts either aerobic capacity or muscle growth may offer clues to prevent diabetes … was reported in the Joslin Diabetes Center Newletter, 2 August, 2018. Some people respond well to both aerobic exercise and strength training, while others don’t. And some of us respond well to only one of those things, but not both. Scientists at Joslin Diabetes Center now have uncovered a surprising molecular “switch” that may help to explain this lack of response to exercise and to give clues to better treatments against diabetes. not activated, muscles improve their adaptation for endurance and aerobic capacity. Released by Close Concerns, 25 September 2018 from the Tandem 2018 Analyst Meeting: Control-IQ launch in summer 2019 with iPump designation; t:sport in 2H20; record Q3 sales of $42-$44 million. That’s a whole bunch of news! The Control-IQ hybrid closed loop is still slated for a summer 2019 launch. In a major regulatory shift, the t:slim X2 will be submitted to FDA as the first “iPump” with interoperability in mind – following Dexcom’s lead with the G6 iCGM clearance. t:sport – a miniaturized, screenless, wirelessly controlled tubed pump – is expected to launch in 2H20. t:sport will be submitted as an iPump with Control-IQ and iCGM integration, meaning no new clinical data will be needed. 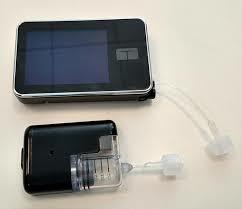 The no-screen pump will be controlle via app on a user’s own phone or a separate touchscreen controller. t:sport is half the size of the current t:slim; will switch to a syringe-driven pumping mechanism; and will add wireless charging, water resistance, an on-device bolus button, and an easier fill process. Closed loop will still run if the phone/controller is out of range. Digital glasses offer hope of sight for vision-impaired was discussed on Leoni Jesner of Israel21c.org on 26 September 2018. 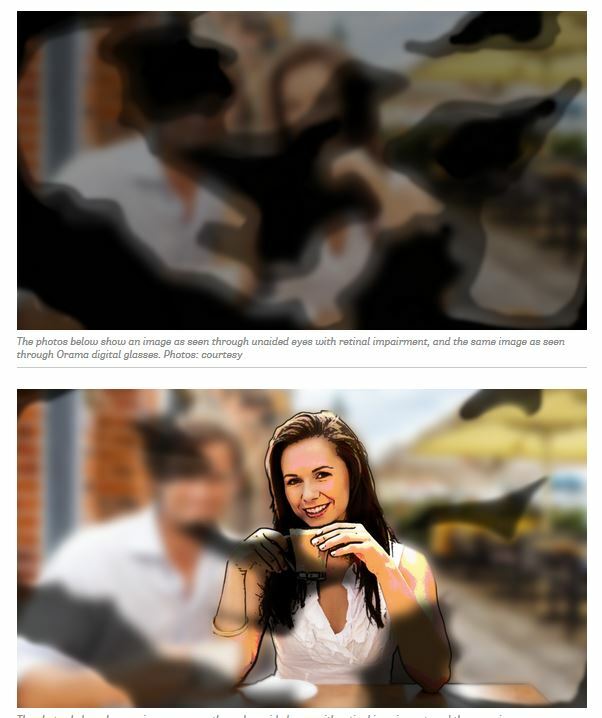 This could be a breakthrough technology for those with impaired vision from retinal damage. 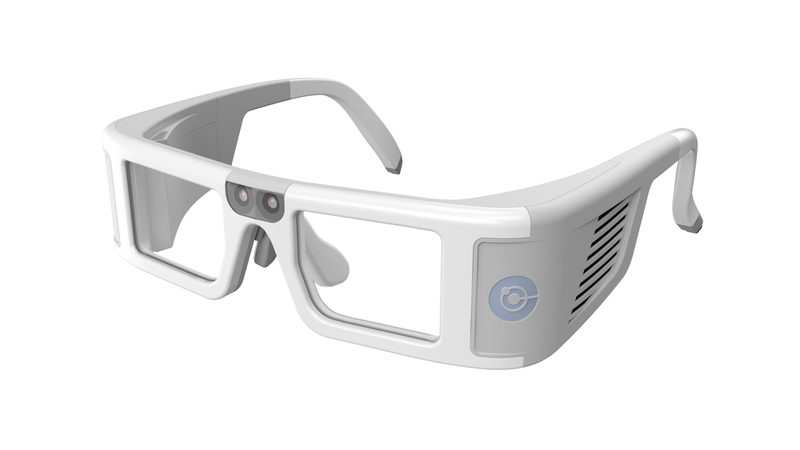 ICI Vision’s Orama high-tech glasses are the brainchild of Haim Chayet, an Israeli optic physicist who was originally creating augmented-reality goggles for motorcyclists. 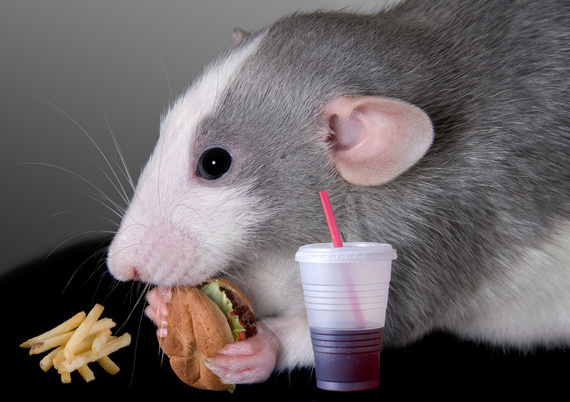 Gut microbes may contribute to depression and anxiety in obesity, according to researchrs at Joslin Diabetes Center, who have now demonstrated a surprising potential contributor to these negative feelings – the bacteria in the gut or gut microbiome, as it is known … reported on the Joslin Diabetes Center newsletter, 18 June 2018. Smart Insulin Pens For Today And The Future was reported by Julie Workman on ASweetLife.org, September 2018. 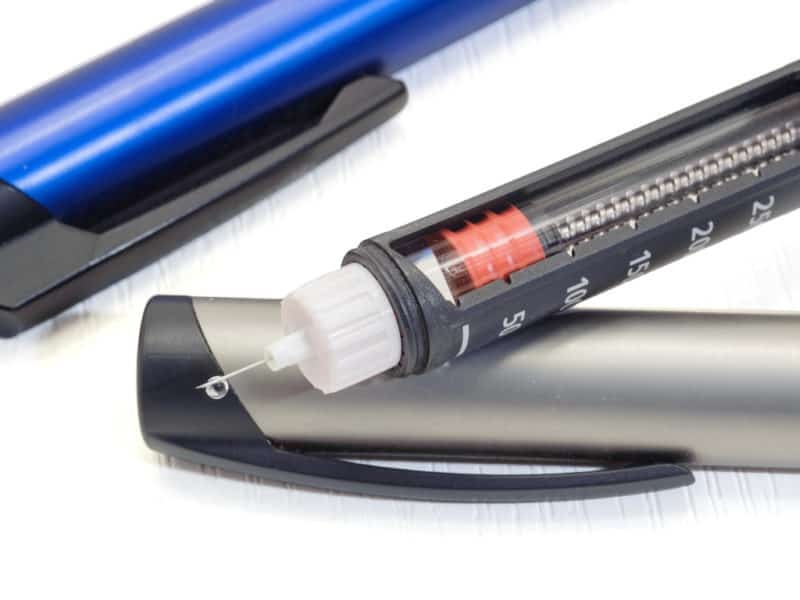 Since NovoPen by Novo Nordisk hit the market back in 1985, technology has continued to move at break-neck speed, resulting in significant improvements for the newest generation of insulin pens. Smart pens offer many benefits of an infusion pump without the disadvantages. Far beyond only keeping track of data, smart pens combine the aspects of injector pens, bolus advisors, Bluetooth technology, and smartphone apps. Smart pens, in conjunction with apps, automatically import glucose readings, calculate recommended dosages, and keep track of insulin dose history to avoid mistakes. Smart pens track dose history and timing, for many months at a time, using Bluetooth-connected apps. So you don’t’ have to remember. Because they automatically record dosages and connect through apps, smart pens can be programmed to share vital information with medical professionals, family members, or other caregivers. Visits to the doctor are much easier when dosage records are kept, allowing doctors to have greater insight into medical needs. When compared to a pump, the smart pen offers all of the benefits with a less shocking price tag. Smart pens are now covered by some major insurers (such as Cigna and United Healthcare) with co-pays as low as $0 and up to a few hundred. Without insurance, smart pens cost around $500.